A wide range of quality and affordable mobility and living aids products to help the elderly, infirm and disabled lead a higher quality of life. Activaids is the name for the mobility range within Sigma, and replaces the former name; Sigmobility. 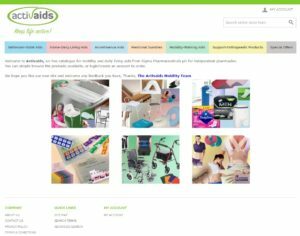 All products within the Activaids range are sourced, ensuring the best quality products from all over the world direct from the manufacturers, at the best possible prices. To help you chose the right product for your customers, our online catalogue includes the latest product range, and all vital information required. To see our full range, product descriptions and pricing visit www.activaids.co.uk. Customers can also place orders securely by logging in with their SigConnect account.